The PMW-EX3 compact camcorder with an interchangeable lens system incorporates three ½-inch type Exmor™ Full HD CMOS sensors, each with an effective pixel count of 1920 x 1080, delivering stunning-quality HD images in 1080P, 720P, and 1080i HD resolutions. A rich variety of features for creative shooting are incorporated into this camcorder such as “Slow & Quick Motion”, which is also commonly known as “over-cranking” and “under-cranking”, selectable gamma curves, slow-shutter, interval recording and Picture Profile™ feature. Additionally, the PMW-EX3 offers a convenient remote-control and multi-camera operation capability, which allows use with high-end camera systems. The XDCAM EX camcorders are equipped with three newly developed 1/2-inch type “Exmor” CMOS Sensors, each with an effective pixel count of 1920 (H) x 1080 (V),which delivers excellent picture performance with full HD resolution. This 1/2-inch type image sensor, with Sony's accumulated sensor technologies, allows the camcorder to provide an excellent sensitivity of F10, a remarkable signal-to-noise ratio of 54 dB, and high horizontal resolution of 1000 TV lines*. It also greatly reduced power consumption and associated heat dissipation of the XDCAM EX camcorders,which made possible the unique use of 1/2-inch type sensors on the compact camcorder. In addition, this large 1/2-inch type image sensor can capture images with a shallower depth of field than all other handheld camcorder's smaller-size image sensors, giving users more creative freedom of expression. A 2/3-inch-type lens** can also be used with the PMW-EX3 camcorder via the mount system by using a 2/3-inch type lens adaptor*** that is equipped with a 12-pin lens connector. This illustrates the breadth of lens choice, including even cinema-style lenses, to suit every specific shooting requirement. *This 1/2-inch type lens adaptor supplied with the PMW-EX3 camcorder is equipped with the hot shoe lens mount connector only. Automatic lens iris control can work only with a lens with hot shoe connectors. Some lens functions are not supported by the PMW-EX3. For more details, please contact each lens manufacturer. **In this configuration, the resulting focal length will be 1.38 times the actual focal length of the lens. ***When using 2/3-inch type lenses with the PMW-EX3 camcorder, the Fujinon ACM-21 lens mount adaptor must be used. The XDCAM EX camcorders are equipped with a high-quality, high-definition Fujinon 14x zoom lens specifically designed for the XDCAM EX camcorder to offer optimum picture performance and unprecedented functionality. It offers a wide angle of view of 5.8 mm (equivalent to 31.4 mm on a 35 mm lens), and many convenient features for diverse shooting situations. The XDCAM EX camcorders, a member of Sony's legendary CineAlta family, offer the native 23.98P* recording capability on its handy body. This feature, accompanied with other creative features makes the camcorder ideal for cinema production. *On the XDCAM EX camcorder, in 1440 x 1080/23.98P mode, images are handled as 23.98P and recorded as 59.94i signals via 2-3 pull-down. The XDCAM EX camcorders offer a powerful Slow & Quick Motion function – commonly known as over-cranking and under-cranking by filmmakers – that enables users to create unique 'looks' or slow- and fast-motion special effects. The XDCAM EX camcorders can capture images at frame rates selectable from 1 fps (frame per second) to 60 fps in 720P mode and from 1 fps to 30 fps in 1080P mode, in increments of 1 fps. For example,when viewed at 23.98P, images captured at 60 fps will appear 2.5 times slower than normal. Conversely, images captured at four fps will appear six times faster than normal. With the Slow & Quick Motion function of this camcorder, images are recorded natively with no padded frames and at full resolution. The obtained quality of the slow- and fast-motion images is extremely high from those created in the editing process. In addition, these slow- and quick-motion images can be played back immediately after shooting, without using any converters or processing on nonlinear editing systems. The XDCAM EX camcorders offer a Slow Shutter function for capturing clear images in low-light environments. The Slow Shutter function not only increases camera sensitivity but also produces a special blurring effect when shooting a moving object, for enhanced shooting creativity. The shutter speed is selectable from 2-, 3-, 4-, 5-, 6-, 7-, 8-, 16-, 32-, and 64- frame accumulation periods. The XDCAM EX camcorders offer a wide variety of gamma curves to flexibly handle contrast, and give a specific 'look' to an image. In addition to four types of standard gamma curves, the XDCAM EX camcorders provide four types of CINE Gamma (CINE 1, 2, 3, and 4),which are identical to those on high-end CineAlta camcorders. Operators can select the best-suited preset gamma curve depending on scenes. The XDCAM EX camcorders offer an Interval Recording function that records one frame at pre-determined intervals. This is convenient for shooting over long periods of time, and also when creating special effects of extremely quick motion. Frame Recording is a unique feature of the XDCAM EX camcorders that is especially useful for clay animation shooting. Using this function, images for pre-determined frames are recorded every time the Record button is pressed. In addition to traditional electronic shutter speed controls adjustable in fractions of a second, the XDCAM EX camcorders also have a “shutter angle” control – which is familiar to filmmakers. 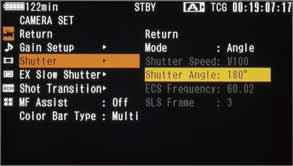 By setting the shutter adjustment mode to “angle”, the XDCAM EX camcorders automatically set the proper exposure time, based on the selected frame rate and shutter angle. The Picture Profile feature of the XDCAM EX camcorders allow camera operators to easily call up customized picture-tonal settings to suit particular shooting conditions, rather than having to readjust the camera each time – giving users greater operational efficiency. Up to six different picture-tonal settings such as the parameters of matrix, color correction, detail, gamma, and knee can be saved in the memory. These settings are displayed on the LCD monitor at the touch of a button. The Shot Transition™ function of the XDCAM EX camcorders, with a simple push of a button, allows for smooth, precise and repeatable automatic scene transitions to occur. The operator can program the duration and select from three transition profiles: Linear, Soft Stop, or Soft Transition. Many lens parameter such as the start and end settings for zoom, focus, and/or camera parameters such as white balance and gain can be programmed to transition in unison. It works by automatically calculating the intermediate values during the scene transition. The Shot Transition function can be triggered manually or synchronized with the camera's REC start function. The transition progress can be checked on a bar graph on the LCD monitor. In addition, a start timer function is also available for the Shot Transition function, helping to prevent operators from missing a shot. This function is very useful when precise, simple or complex changes to the lens or camera settings are required during the scene – for example,when changing the focus from the background to the foreground of a scene. The XDCAM EX camcorders are equipped with a newly developed, large, easy-to-view, color LCD screen with a high resolution of 1920 x 480 pixels. The LCD screen of the XDCAM EX camcorders can be flexibly rotated for accessible viewing from any shooting angle. The ease of focusing offered by this high resolution panel, location and adjustability permits using it as a viewfinder or camera assistant operator panel. It can also be used to instantly review recorded footage, as well as access the camera's set-up menus and view thumbnails, display status indications such as audio meters, depth-of-field indicators, remaining memory capacity and battery time. What's more, the use of the hybrid LCD screen - which comprises transmissive and reflective panels - offers clear viewing in both studio and “full sun” field shooting conditions. Frequently used functions can be programmed onto four assignable buttons on the XDCAM EX camcorders, allowing operators to make rapid changes when working in the field. These can be functions such as ATW, Freeze Mix, Rec Review, Expanded Focus, Depth-of-field indicator, and more. In order to facilitate zoom control and recording operation during low-angle shooting, an additional zoom switch and record start/stop button are located on the carrying handle of the XDCAM EX camcorders. The hand grip of the XDCAM EX camcorders can rotate approximately 120 degrees,which allows camera operators to flexibly adjust the angle of the grip. This gives users greater control and comfort when holding the camera from any shooting position. The XDCAM EX camcorders come equipped with a built-in stereo microphone and two XLR audio input connectors for connecting professional microphones or feeding an external-line audio source. These allow high-quality, two-channel 16-bit, 48-kHz linear PCM uncompressed audio to be recorded on the XDCAM EX camcorder. The XDCAM EX camcorders come equipped with a wide range of interfaces optimized for a variety of operational needs, wide interoperability and flexible workflow. 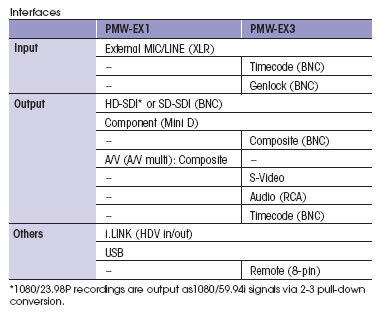 These include an HD-SDI output, down-converted SD-SDI output, i.LINK (HDV) input/output, and analog composite/ component output. 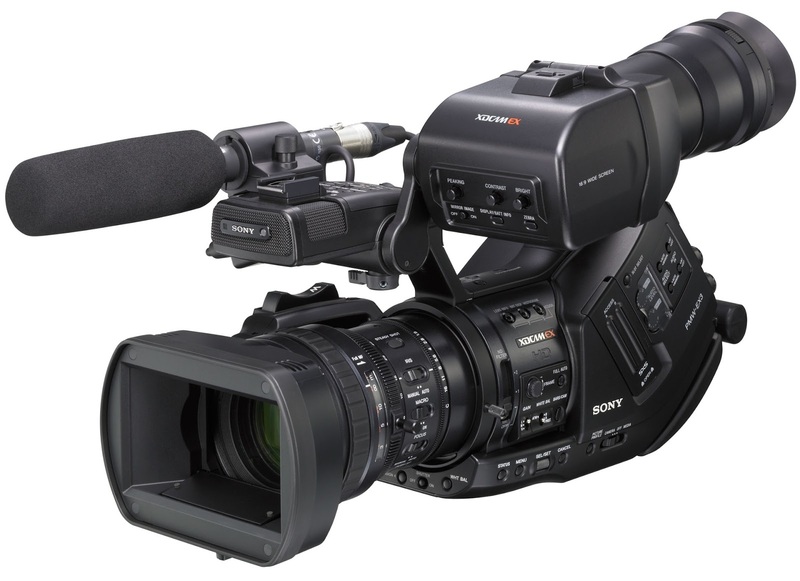 Additionally, the PMW-EX3 camcorder is equipped with the Timecode input/output and Genlock input, allowing the camcorder to be used in the multi-camera system. *Some controls on the RM-B150/B750 are not supported by the PMW-EX3 camcorder. 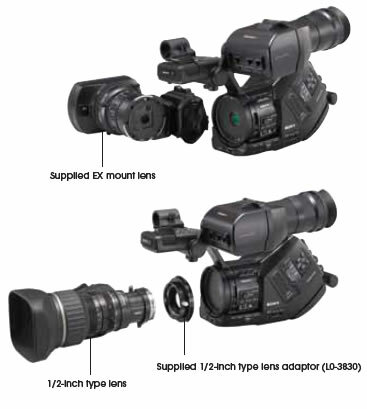 The position of the shoulder pad of the PMW-EX3 camcorder can be selected from two positions. In addition, the PMW-EX3 camcorder is supplied with a detachable cheek pad. Operators can always attain a comfortable and well-balanced camera position, even when the camcorder is docked with long lenses. The lens adopts a newly developed and unique focus ring mechanism,which offers two types of manual focus, plus an auto focus operation. The lens is equipped with two independent focus wheel mechanisms,which can be switched by sliding the focus ring itself back and forth. When the focus ring is in the front position, the lens works in the same way as a typical auto focus lens on a handheld camcorder. In this case, either manual or auto focus mode can be selected by the AF/MF switch on the lens. On the other hand,when the focus ring is set to the back position, the lens has an absolute focus position, and works in the same way as interchangeable-lens,which professional users are familiar with. 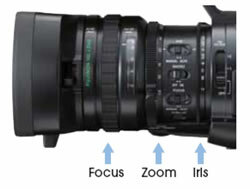 In addition to the unique focus ring, the lens is equipped with independent rings for zoom and iris adjustment; all have physical stops and absolute markings permitting precise adjustments. The location, rotational range and feel are identical to other manual high-end HD lenses. This gives users a high level of familiarity and operational comfort. To minimize the blurring effect caused by hand-shake, the lens incorporates an optical image stabilizer function that provides highly stable images. The AF (Auto Focus) Assist function of the XDCAM EX camcorders enables operators to manually change focus positions using the focus ring during AF mode. This means that AF reference focus positions can be positively shifted manually to a new position. The MF (Manual Focus) Assist function of the XDCAM EX camcorders helps to precisely focus on the target subject when shooting in MF mode. 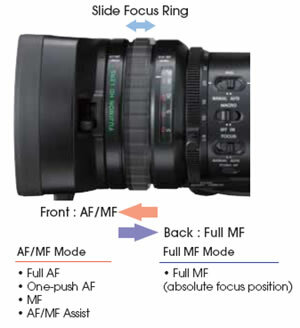 When the MF Assist is enabled, the auto focus is momentarily activated when the user stops adjusting the focus ring. The camera will then finely focus on the subject closest to the focal point of the lens at that time. At the touch of a button, the center of the screen on the LCD monitor and viewfinder of the XDCAM EX camcorders can be magnified to about twice the size,making it easier to confirm focus settings during manual focusing.